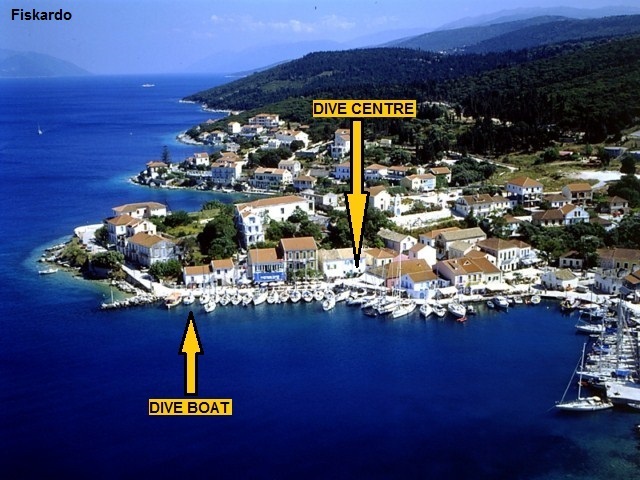 FISKARDODIVERS Eco-Dive-Resort is located in FISKARDO harbour. FISKARDO is a small village situated at the northern point of the island of KEFALONIA. KEFALONIA is the largest of the Ionian Islands with 700 sq. km in surface area and is probably the most beautiful and authentic. The Ionian Islands otherwise known as “Eptanisa”, the 7 Islands, are situated in the Ionian Sea on the west side of Greece. KEFALONIA is a mountainous island with impressive landscapes, dense vegetation, beautiful beaches, a vibrant capital, small traditional villages, Orthodox Churches, archaeological ruins, Venetian castles, a National Park for the protection of the fauna and flora around Mount Ainos (1628 meters at his highest point), some animated beach resorts with many restaurants, bars and clubs, etc. KEFALONIA is also known for its rugged geological structure which adds character and charm to the island. You will enjoy the crystal-clear water ideal for scuba diving with an amazing underwater visibility that can exceed 40 meters, and a high average sea temperature during the season. Nothing pleases us more than to make your diving experience fun and memorable. All of our instructors have gone through rigorous and professional training, and are here to help you overcome your fears and anxiety, so that you can fully enjoy the magical sensation of breathing underwater and discover the marine life in full security. Regardless of whether you are young or old, timid or adventurous, inexperienced or a qualified diver, FISKARDODIVERS Eco-Dive-Resort offers a programme for everyone (from 5 years old).We try our best to adjust our programmes to suit your needs and interests.